“Embrace the ride, no? That’s what Salt Lake City residents Adam Clark and Brody Leven did last October when the duo embarked on a 3,000-plus-mile road trip through Chile and Argentina to ski exotic volcanoes. “Their only plan was to drive as far south on the continent as possible. Whatever happened in the midst of those dusty and bumpy roads they’d figure out upon arriving to that situation. “Although Leven could probably write a book of this month-long journey from his journal entries, 68 pages of Clark’s photography should suffice with insightful and witty commentary from Leven that can only come from being on the road. At Snoworks they have a dream, to ski exotic destinations with richly varied cultures. In 2002, they headed for South America and over the last 12 years have created and fine-tuned one of the most diverse ski adventures you will find anywhere in the world. Ski Chile is a no holds-barred ski extravaganza combining amazing skiing experiences, spectacular southern-hemisphere winter scenery with extraordinary local culture – skiing Chilean ski resorts in the Lakes and Volcano District and staying in some extraordinary places. Ski South America is designed for competent off-piste skiers. (Snoworks Levels 5 & 6). Although we also can take adventurous levels 4 skiers with limited off-piste experience. If you’re an adventurous level 4 please enquire as to whether your skiing level is at the minimum level for the trip. We’ve created an itinerary to cater for a difference in skill level and aspirations. At each destination you have the option of skiing off-piste accessed by mechanical uplift wherever possible, as well as the option of skinning, climbing and skiing from the summit of 5 volcanoes. A thousand kilometres north of Bariloche, in the western reaches of Mendoza province, the also large Las Leñas, dating from 1983, can at times be the most challenging ski resort in South America. But that depends on the weather and whether a particular lift is open or closed. Provided there’s stable snow and not too much wind to open the avalanche-prone Marte chair, then expert skiers and snowboarders are in for a real treat. The lift provides the only mechanised access to some extraordinary off-piste, with plunging powder bowls and narrow couloirs. The area is dotted with cliffs and, again, exposed to the possibility of avalanches, so it’s the kind of place where a local guide is absolutely essential. When the Marte chair is closed, Las Leñas amounts to an enjoyable but perhaps slightly bland Andean resort – a treeless wilderness a 90-minute flight from Buenos Aires to Malargue, followed by an hourlong bus ride; there are no cities or towns in the area but some robust nightlife nonetheless. All the accommodation here is in hotels and lodges within a short distance of a lift. The Hotel Virgo & Spa is the most comfortable place to stay, with an in-house cinema and a kids club. Hey, you don’t have to wait until fall to go skiing. Just jump on a jet and head to the southern hemisphere, where winter is just beginning and the ski resorts are opening for their season. The South America skiing season in Argentina and Chile runs from June through October, with skiing for all levels, modern lifts, some great off-piste skiing, quirky resorts and eclectic hotels. Stir in a day or two of wine-tasting at one of the outstanding wineries close to Santiago, or an evening beef-eating and tango in Buenos Aries, and you have the perfecto South America ski holiday! Argentina has more than a dozen snow resorts scattered around the Andes, with resorts near Mendoza, the Lake District and Patagonia in the south, and Ushuaia further south. But Bariloche (top and right) is the biggest and best known in the country, and indeed, the most prominent on the continent. Down in Patagonia, some 17 to 20 hours by road and a 2-hour flight from Buenos Aires, San Carlos de Bariloche is a pretty, Teutonic-flavoured city not far from the Chilean border. 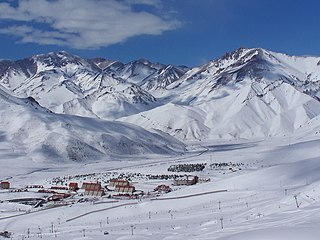 The main ski station here, Cerro Catedral, has a modern system of 39 lifts, mainly intermediate slopes, lots of off-piste, and a vertical drop of 1,070 m (3,512 ft.). Bariloche also happens to be Argentina’s chocolate capital (because of all its German and Austrian immigrants) and I’d highly recommend a visit to the Fenoglio Museum of Chocolate and a sweet browse along the chocolate shops of Calle Mitre, the main drag. You can stay at the Knapp Hotel, which is right by the lifts and has an in-house chocolate shop.